Eka Kurniawan was born in Tasikmalaya, Indonesia in 1975. He studied philosophy at Gadjah Mada University, Yogyakarta and has since published several novels and short stories. He was longlisted for the Man Booker International Prize 2016 and his books have been translated into 27 languages. His highly acclaimed, epic work of magical realism Beauty is a Wound is also available from Pushkin Press. A thrilling, comic and gritty new novel from this high-acclaimed Indonesian author, it is peppered with high-speed car chases, fights, corruption and desire. Vengeance Is Mine, All Others Pay Cash shows Eka Kurniawan in a gritty, comic, pungent mode that fans of Quentin Tarantino will love. 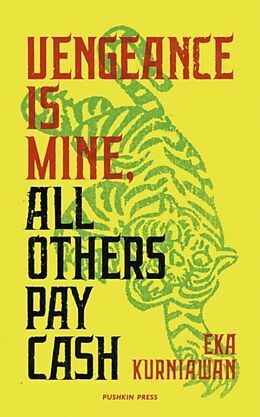 But even with its liberal peppering of fights, high-speed car chases, and ladies heaving with desire, the novel continues to explore Kurniawan's familiar themes of female agency in a violent male world dominated by petty criminals and a corrupt police state.